1. User-friendly LCD control panel with auto memory for mold production program. 3. Error display to enable rapid trouble-shooting. 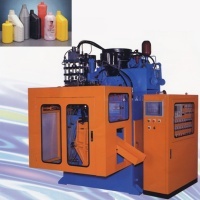 These series have multi-functions for different products, such as visible stripe for motor oil, toys with two colors, and high quality bottles with two layers (cosmetic, shampoo bottles etc.) It also can produce the bottles with three layers, depending on the requirement of the customers.